VINTAGE COSTUME ESTATE ANTIQUE JEWELRY NECKLACES! 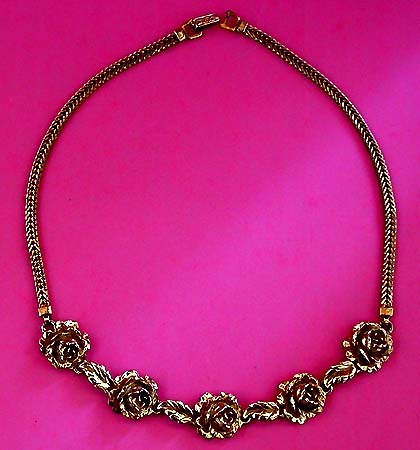 Carved Rose Goldtone Vintage Estate Antique Necklace For Weddings, Proms, Pageants And Parties! 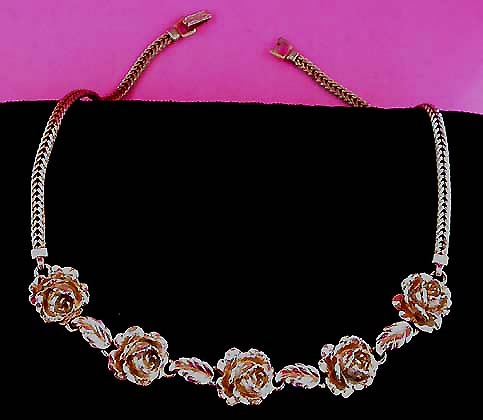 Item #N168159 - Carved Rose Goldtone Vintage Estate Antique Necklace. Remarkably beautiful! The center is a five-link design of deeply carved goldtone roses alternating with goldtone carved leaves. Each beautiful rose measures 5/8" x 5/8" and 3/8" tall. Each articulated leaf measures 1/2" x 1/4". The gorgeous center piece measures 5" in length and 5/8" wide. This lovely necklace closes with a foldover clasp. I have a matching bracelet listed in the bracelet section. A fabulous necklace to wear at weddings, prom nights, pageants, parties, cruises and special functions! US$68.00. SOLD.